A crown is a cosmetic restoration that completely covers the tooth. At Pacific Dental Aesthetics we believe in avoiding crowns if at all possible in favor of a more conservative approach, such as an on-lay. While crowns are a more aggressive restorations, they are still the best treatment when a tooth has previously had a crown or when the area of decay or the compromised tooth structure is too large for an on-lay. When decay or fracture incorporate areas of a tooth that make composite (tooth colored filling) restorations inadequate, such as cuspal fracture or remaining tooth structure that undermines perimeter walls of a tooth, an on-lay is indicated. Less Trauma to the Nerve inside the tooth, therefore, there is less of a chance of a Root Canal being needed on the tooth. 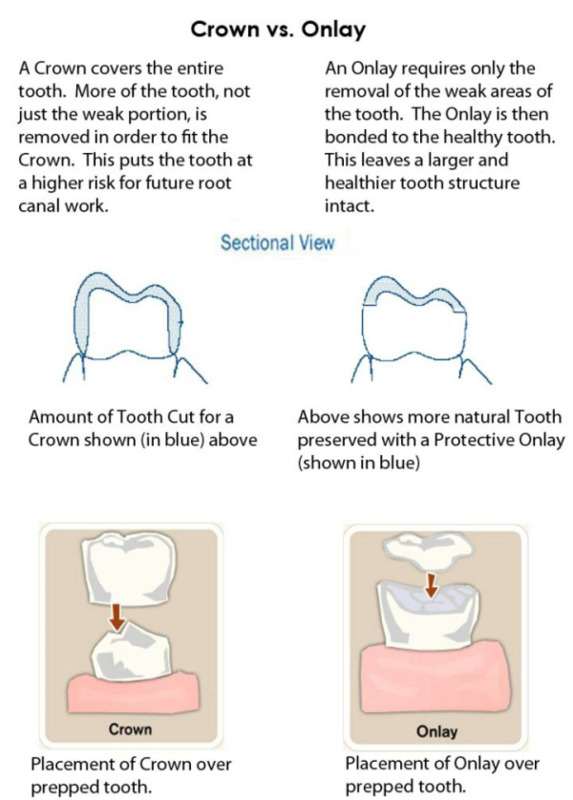 Preservation of the natural tooth structure. We at Pacific Dental Aesthetics believe that if tooth structure is healthy, it is best to leave it alone if possible. Less chance of recurrent decay at the margin (edge of the restoration), since the margin of an on-lay is in a higher, clean-sable area. While margins of a crown is located at or below the gum line. Since on-lays don't go down to the gum line, there is no chance of on-lays irritating the gum. Crowns can cause gum irritation and in some cases can even contribute to gum disease. Porcelain onlay example:Usually about two millimeters thick, and it covers at least one cusp of the tooth. 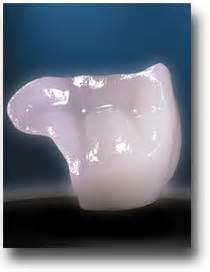 This example is made to fit a molar tooth, and it will cover one of the four cusps of the tooth.